Enlarged, abnormally twisted and swollen veins called varices form in the stomach and lower part of the esophagus to transport the blood diverted from the liver. 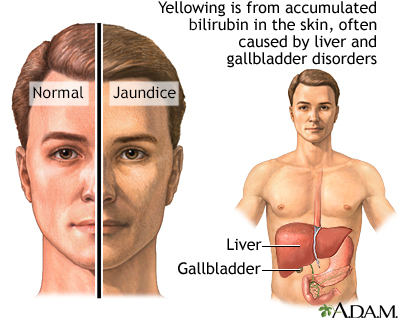 Bilirubin, a substance found in bile, also builds up in the bloodstream, resulting in jaundice, a yellowish discoloration of the skin and eyes, as well as dark-colored urine. Fluid buildup in the abdomen (called ascites), and swelling in the legs (edema) occur. Processing Healthful Nutrients. The liver processes (metabolizes) and stores all of the nutrients the body requires, including sugars, fats, minerals (iron and copper) and vitamins. Producing Proteins. The liver is the body's "factory" where many important proteins, such as albumin, are made. The liver also produces essential proteins for blood clotting. Producing Bile. The liver produces bile, which is important in digestion. Bile is a green-colored fluid that helps the body absorb fats and fat-soluble vitamins. Bile contains bilirubin, a yellow-brown pigment produced from the breakdown of hemoglobin, the oxygen-carrying component in red blood cells. Eliminating Toxins. An important job of the liver is to make toxic substances in the body harmless. These include substances made by the body (such as ammonia and by-products of digestion) and substances you may ingest (such as alcohol and drugs). Nonalcoholic fatty liver (NAFL) or fatty liver is the earliest stage of NAFLD. It is marked by the presence of fat in the liver (steatosis), but liver damage has not occurred. While a fatty liver is not normal, NAFL is not considered a serious condition. Nonalcoholic steatohepatitis (NASH) is the next stage of NAFLD. NASH is characterized by liver inflammation and injury, as well as a fatty liver. NASH is dangerous because it can lead to the scarring of the liver associated with cirrhosis. NASH is one of the leading causes of cirrhosis. 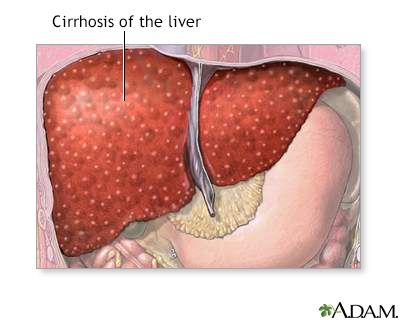 Cirrhosis is the final irreversible stage of NAFLD. Compensated cirrhosis. Means that the body still functions fairly well despite scarring of the liver. Many people with compensated cirrhosis experience few or no symptoms. Decompensated cirrhosis. Means that the severe scarring of the liver has damaged and disrupted essential body functions. People with decompensated cirrhosis develop many serious and life-threatening symptoms and complications. Spontaneous bacterial peritonitis is a complication of ascites. It is a life-threatening bacterial infection of the membrane that lines the abdomen. Symptoms include confusion and altered mental status, fever, chills, and abdominal pain. Certain medications, such as proton pump inhibitors (used for treating acid reflux and gastroesophageal reflux disease), may increase the risk for spontaneous bacterial peritonitis in people with cirrhosis. Blood tests are used to measure liver enzymes associated with liver function. Enzymes known as aminotransferases, including aspartate (AST) and alanine (ALT), are released when the liver is damaged. Serum albumin concentration. Albumin is a protein made in the liver. Serum albumin measures the amount of this protein in the blood (low levels indicate poor liver function). Alkaline phosphatase (ALP). High ALP levels can indicate bile duct blockage. Bilirubin. Bilirubin, a red-yellow pigment that is normally metabolized in the liver and then excreted in the bile. A damaged liver cannot process bilirubin, and blood levels of this substance rise. Creatinine. High levels of creatinine indicate impaired kidney function. Percutaneous liver biopsy. Uses a needle inserted through the skin over the liver area to obtain a tissue sample from the liver. Transjugular liver biopsy. Uses a catheter (a thin tube) that is inserted in the jugular vein in the neck and threaded through the hepatic vein (which leads to the liver). A needle is passed through the tube, and a suction device collects liver samples. Laparoscopy. Is a procedure in which the doctor makes a small abdominal incision and inserts a thin tube that contains a tiny camera to view the surface of the liver. The doctor can place small surgical instruments through the tube to take a tissue sample. Stop drinking alcohol. It is very important for people with cirrhosis to completely abstain from alcohol. Restrict dietary salt. Sodium (salt) can increase fluid buildup in the body. Follow a low-sodium diet with plenty of fresh vegetables and fruits and avoid eating processed foods. Eat a healthy diet. People with cirrhosis are usually malnourished and require increased calories and nutrients. Your doctor may suggest you take a vitamin supplement. Get vaccinated. Vaccinations (such as hepatitis A, hepatitis B, influenza, pneumococcal pneumonia) are important. Ask your doctor which vaccinations you need. Discuss all medications with your doctor. Before you take any medications, ask your doctor if they are safe for you. Liver damage affects the metabolism of drugs. Opioids, sedatives, anti-anxiety drugs, and proton pump inhibitors can trigger serious complications. Nonsteroidal anti-inflammatory drugs (NSAIDs) such as aspirin, ibuprofen, and naproxen should not be used because they can trigger bleeding, worsen cirrhosis, and potentially cause kidney failure. In recommended doses, acetaminophen (Tylenol, generic) is a safer choice for pain management. Inform your doctor of any herbs or supplements you are considering taking. Certain types of herbal remedies (kava, chaparral, kombucha mushroom, mistletoe, pennyroyal, and some traditional Chinese herbs) can increase the risk for liver damage. Although some herbs, such as milk thistle (silymarin) have been studied for possible beneficial effects on liver disease, there is no scientific evidence that they can help.